Beekeeping (or apiculture, from Latin apis, a "bee") is the practice of intentional maintenance of bees by humans, and mainly refers to maintenance of colonies of honeybees. A beekeeper (or apiarist) may keep bees in order to collect honey, beeswax, or other products, or for the purpose of pollinating crops, or to produce bees for sale to other beekeepers. A location where bees are kept is called an apiary. Beekeeping represents a means by which human beings can harmoniously interact with nature. In order to receive the product of honeybees, or their pollination services, human beings have to care for and assist the bees, rather than killing, hurting, or controlling them. The bees continue to do what they do naturally, but human being provide the supporting environment. This fits with the view of many religions that depict human beings as stewards of creation, utilizing nature for human prosperity, but with human beings as the subject partners of love and bees as the object partner, thriving under human management. A. mellifera, the European honeybee, or western honeybee, is the most popular domesticated honeybee. The only other domesticated honeybee is A. cerana, the Asiatic honeybee or eastern honeybee, which is a species of small honeybees of southern and southeastern Asia. 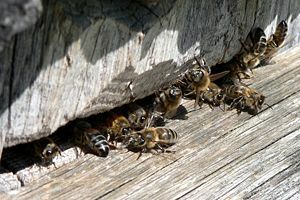 While it normally makes nests in cavities, it is sometimes managed in hives in a similar fashion to Apis mellifera, though on a much smaller and regionalized scale. Stingless bees (sometimes called stingless honeybees), a large group of bees comprising the tribe Meliponini and closely-related to honeybees, are also reared, generally not for honey but for conservation or local pollination purposes. Only in some areas do stingless bees produce more honey than needed for a colony's survival. Traditionally, beekeeping was done for the bees' honey harvest. 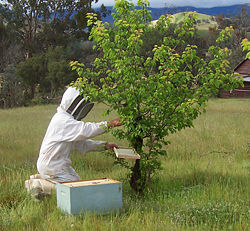 However, in modern times, crop pollination service can often provide a greater part of a commercial beekeeper's income. Modern hives enable beekeepers to transport bees, moving from field to field as the crop needs pollinating, allowing the beekeeper to charge for the pollination services they provide. In addition to honey, other hive products include pollen, royal jelly, and propolis, which are used for nutritional and medicinal purposes. Royal jelly, which is a honeybee secretion used in the nutrition of larva, is sold as a dietary supplement, while the pollen collected by bees from flowers is sold as a protein supplement. Propolis is a wax-like resinous substance collected by honeybees from tree buds or other botanical sources and used as cement and to seal cracks or open spaces in the hive. Propolis is marketed by health food stores as a traditional medicine, and for its claimed beneficial effect on human health. Holistic therapists often utilize propolis for the relief of many inflammations, viral diseases, ulcers, superficial burns or scalds, in conjunction with acupuncture, ayurveda, or homeopathy. Another product from bees is wax, which is used in candle making, cosmetics, wood polish, and for modeling. 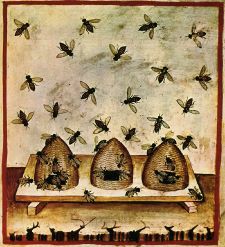 Beekeeping is one of the oldest forms of food production. 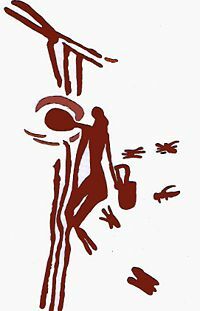 Some of the earliest evidence of beekeeping is from rock painting, dating to around 13,000 B.C.E. It was particularly well developed in Egypt and was discussed by the Roman writers Virgil, Gaius Julius Hyginus, Varro, and Columella. A pioneering beekeeping popularizer in nineteenth century America was Amos Root. Western honeybees are not native to the Americas. American colonists imported honeybees from Europe, partly for honey and partly for their usefulness as pollinators. Australian and New Zealand colonists did the same. The first honey bee species imported were likely European dark bees. Later Italian bees, carniolan honeybees, and Caucasian bees were added. The American Reverend Lorenzo L. Langstroth started scientific beekeeping in 1851, and is known as the "Father of American beekeeping" (Nash 2003). He developed the movable-frame hive, authored Langstroth on the Hive and the Honey-Bee: A Bee Keeper's Manual, and with contemporary Moses Quinby wrote Mysteries of Beekeeping Explained and made major practical contributions that led to this new industry (Nash 2003). Western honeybees were also brought to the Primorsky Krai in Russia by Ukrainian settlers around 1850s. These Russian honey bees that are similar to the Carniolan bee were imported into the U.S. in 1990. The Russian honeybees have shown to be more resistant to the bee parasites, Varroa destructor and Acarapis woodi. Prior to the 1980s, most U.S. hobby beekeepers were farmers or relatives of farmers, lived in rural areas, and kept western honeybees with techniques passed down for generations. The arrival of tracheal mites in the 1980s and varroa mites and small hive beetles in the 1990s removed most of these beekeepers because they did not know how to deal with the new parasites and their bees died. In addition, the growth of crop pollination services as a greater part of the commercial beekeepers income revised the historical role of the self-employed beekeeper, and favoring large-scale commercial operations. The U. S. beekeeping industry produced, in 1899, about 31,000 tons of honey and over 880 tons of beeswax, but by 1970, there were 4.6 million colonies producing over 117,000 tons of honey and over 2,300 tons of beeswax, valued at $40.8 million and $2.8 million, respectively (Nash 2003). Production by the turn of the twenty-first century, however, averaged only some 100,000 tons of honey annually, attributed to such factors as declining habitat, spread of parasites, decline in beekeepers, and foreign competition (Nash 2003). Presently, the most serious threat is the abrupt decline in honeybee colonies (Colony Collapse Disorder). In Asia, other species of Apis exist, whose nests are used by local beekeepers to collect honey and beeswax, while A. cerana, the eastern honeybee, is raised in hives like the western honeybee. Non-Apis species of bees, known collectively as stingless bees, have also been kept from antiquity in Australia and Central America, although these traditions are dying, and the trigonine and meliponine species used are endangered. Most stingless beekeepers do not keep the bees for honey but rather for the pleasure of conserving a native species whose original habitat is declining due to human development. In return, the bees pollinate crops, garden flowers, and bushland during their search for nectar and pollen. While a number of beekeepers fill a small niche market for bush honey, native stingless bees only produce small amounts and the structure of their hives makes the honey difficult to extract. It is only in warm areas of Australia, such as Queensland and northern New South Wales, that the bees can produce more honey than they need for their own survival. Harvesting honey from a nest in a cooler area could weaken or even kill the nest. The control of a colony mainly consists in taking care of the state of the “demography” of the hives. A colony of honeybees is composed of a single queen, many workers (infertile females), drones (males), and of brood (eggs, larvae, and pupae). A hive is the box used by beekeepers to house a colony. To reproduce and survive, a colony of bees tries to accumulate a surplus of provisions (nectar and pollen) during the more favorable seasons (when there is a lot of forage, such as flowers available, along with good weather) in order to be able to survive the more unfavorable seasons. In the countries of the Northern Hemisphere, this period is the winter; in the Southern Hemisphere and in Africa, this period is the dry season, or summer. The population of the honeybee colony varies according to the seasons. It is important for the western honeybee colony to have a large population (30,000 to 60,000+ individuals) when there is a lot of forage available, in order to achieve the greatest possible harvest. The population is minimal in the winter (6,000 individuals) in order to reduce the consumption of provisions. However, the colony should not be too weak, because the bees that overwinter have to revive the colony again in the spring. If the population was too small over the winter, another problem would be encountered. Honeybees need to cluster together during the winter in order to maintain the required temperature for their survival, and with reduced populations it would be more difficult to achieve this temperature threshold. Hobbyists—They have a different regular employment or means of support, but find beekeeping fun as only a hobby. Sideliners—They use beekeeping as a way to supplement their principle income. Commercial—Beekeeping is their only source of income. The modern U.S. hobby beekeeper is more likely to be a suburbanite: He or she tends to be a member of an active bee club, and is well-versed on modern techniques. Some southern U.S. and southern hemisphere (New Zealand) beekeepers keep bees primarily to raise queens and package bees for sale. In the U.S., northern beekeepers can buy early spring queens and 3- or 4-pound packages of live worker bees from the South to replenish hives that die out during the winter. In cold climates, commercial beekeepers have to migrate with the seasons, hauling their hives on trucks to gentler southern climates for better wintering and early spring build-up. Many make "nucs" (small starter or nucleus colonies) for sale or replenishment of their own losses during the early spring. In the U.S., some may pollinate squash or cucumbers in Florida or make early honey from citrus groves in Florida, Texas, or California. The largest demand for pollination comes from the almond groves in California. As spring moves northward, so do the beekeepers, to supply bees for tree fruits, blueberries, strawberries, cranberries, and later vegetables. Some commercial beekeepers alternate between pollination service and honey production, but usually cannot do both at the same time. In the Northern Hemisphere, beekeepers usually harvest honey from July until September, though in warmer climates the season can be longer. The rest of the year is spent keeping the hive free of pests and disease, and ensuring that the bee colony has room in the hive to expand. Success for the hobbyist also depends on locating the apiary so bees have a good nectar source and pollen source throughout the year. In the Southern Hemisphere, beekeeping is a year round enterprise, although in cooler areas (to the south of Australia and New Zealand) the activity may be minimal in the winter (May to August). Consequently, the movement of commercial hives is more localized in these areas. There are considerable regional variations in the type of hive in which bees are kept. A hive is a set of wooden boxes filled with frames that each hold a sheet of wax or plastic foundation. The bottom box, or brood chamber, contains the queen and most of the bees; the upper boxes, or supers, contain only honey. The bees produce wax and build honeycomb using the wax sheets as a starting point, after which they may raise brood or deposit honey and pollen in the cells of the comb. These frames can be freely manipulated and honey supers with frames full of honey can be taken and extracted for their honey crop. In the United States, the Langstroth hive is commonly used. The Langstroth was the first type of hive with movable frames, and other designs of hive have been based on it. In the United Kingdom, the most common type of hive is the National Hive, but it is not unusual to see some other sorts of hive (Smith, Commercial, and WBC, rarely Langstroth). The more traditional skep is now largely unlawful in the United States, as the comb and brood cannot be inspected for diseases. A few hobby beekeepers are adapting various top-bar hives commonly found in Africa. These have no frames and the honey filled comb is not returned to the hive after extraction, as it is in the Langstroth hive. Because of this, the production of honey in a top bar hive is only about 20 percent that of a Langstroth hive, but the initial costs and equipment requirements are far lower. Top-bar hives also offer some advantages in interacting with the bees. 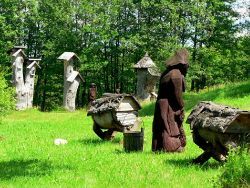 When interacting with the bees, novice beekeepers usually wear protective clothing (including gloves and a hooded suit or hat and veil). Experienced beekeepers rarely use gloves, because they make movement clumsy and can transmit disease from one hive to another. The face and neck are the most important areas to protect, so most beekeepers will at least wear a veil (Graham et al. 1992). The protective clothing is generally light colored and of a smooth material. This provides the maximum differentiation from the colony's natural predators (bears, skunks, etc. ), which tend to be dark-colored and furry. Smoke is the beekeepers second line of defense; protective clothing provides remarkably little protection from agitated bees. 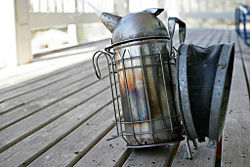 Most beekeepers use a "smoker"—a device designed to produce incomplete combustion of various fuels, which generates smoke that can be directed into the beehive. The bees appear to be calmed with a puff of smoke, which triggers a feeding response in anticipation of possible hive abandonment due to fire and masking of any alarm pheromones. The ensuing confusion creates an opportunity for the beekeeper to open the hive and work without triggering a large defensive reaction from the occupants. Also, the bee's abdomen distends from the honey consumed and it becomes difficult to make the necessary flexes to sting. This page was last modified on 10 October 2018, at 22:03.